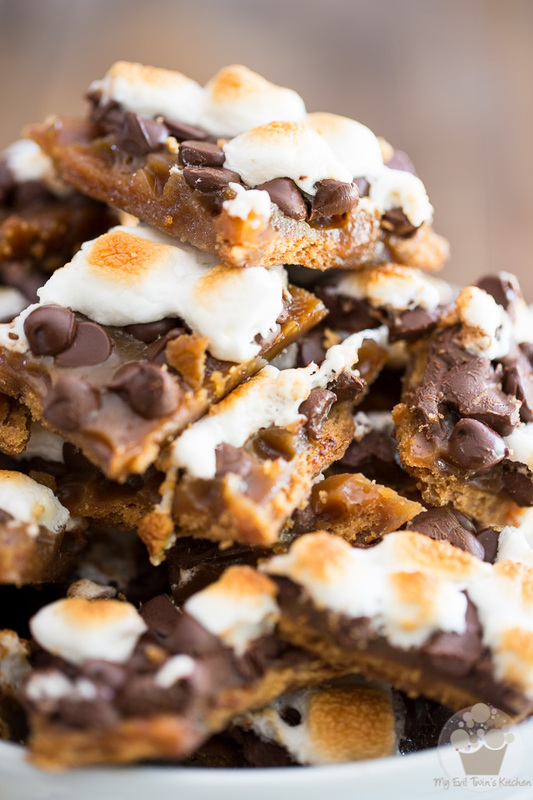 This S’mores Cracker Toffee should in fact be called Crack Toffee: once you start, you just can’t stop! Seriously. Consider yourself warned. I strongly suggest that you leave this place at once. Hit the back button or click the little × in the top corner of this window, like, right now. Trust me, it’s for your own sake! I only have your well-being at heart when I say this. Honest to God! What? You’re still here? Not only that, but you’re still reading, too? Oh, you’re asking for trouble. 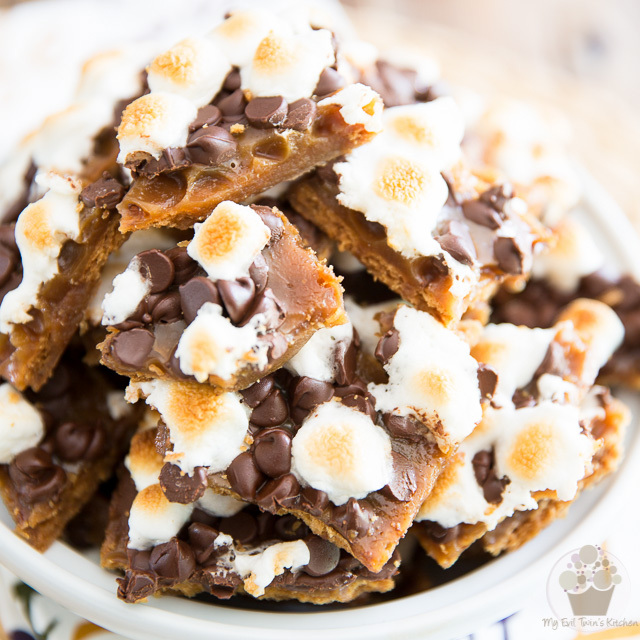 Quite evidently, you’ve never had cracker toffee before in your life, you… Or perhaps you have, only it wasn’t S’mores Cracker Toffee!!! This stuff, I’m warning you, is HIGHLY addictive. H-I-G-H-L-Y. 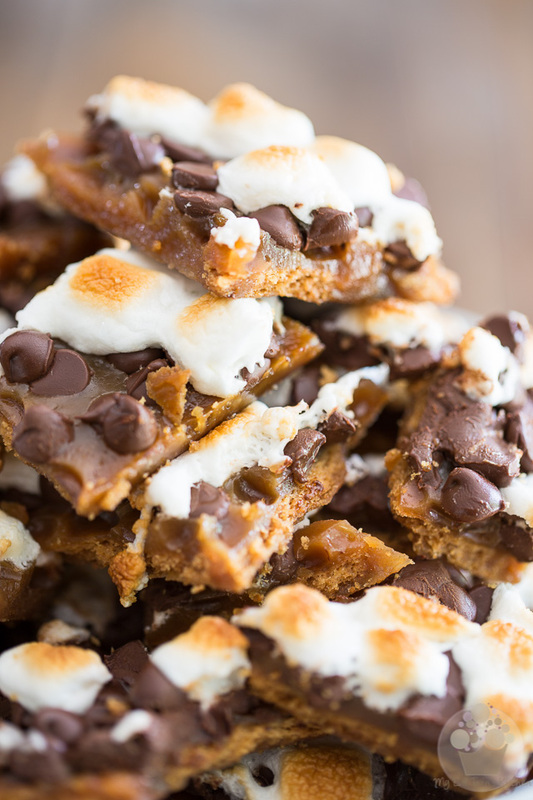 In fact, this S’mores Cracker Toffee should be called Crack Toffee, for once you get a taste of it, you just can’t stop and you always want more. Days later, you’ll still be dreaming about it. And then you’ll come back here just to look at the pictures and drool a little. BUT! 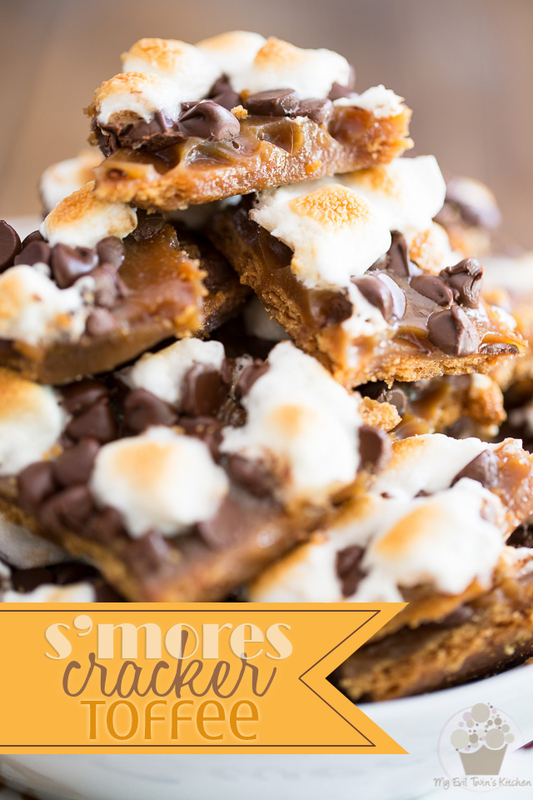 I’ve had some of this S’mores Crack Toffee and trust me, now I want to try S’mores all-kinds-of-things. I highly doubt, though, that any of them will come even close to being as good, or as addictive, as this Cracker Toffee. This stuff is crunchy, creamy, chewy, salty and sweet all at once, and every flavor and texture is as bold and intense as the next one. The worst part about this dangerously addictive treat is that you get to break the stuff into pieces, you know… some large, some small. This means you constantly get to scan the pile and say to yourself: “Oh, I’ll only have a small piece, just a tiny little one. Yeah, like this one right here. It’s so small. Where’s the harm in that?” But the thing is, you can NEVER stop at just one. And the smaller the pieces you pick, the more you eat. It’s as simple as that! 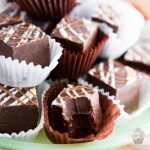 As if that wasn’t enough, say you thought you’d found a magical solution to curb the uncontrollable cravings and told yourself “I know, I’ll put the darn things in the freezer, that way I won’t be tempted to eat them all…” HA, well have I got news for you!!!! These evil things, they’re just as good, if not better, when eaten straight out of the freezer. So really, there’s no escaping them. Whether you choose to eat them frozen, cold, or at room temperature, they’re just as equally delicious and highly addictive. Oh, and did I tell you just how crazy easy this stuff is to make? Unfortunately, it is… sorry! So there you have it. Don’t say I haven’t given you a fair warning. 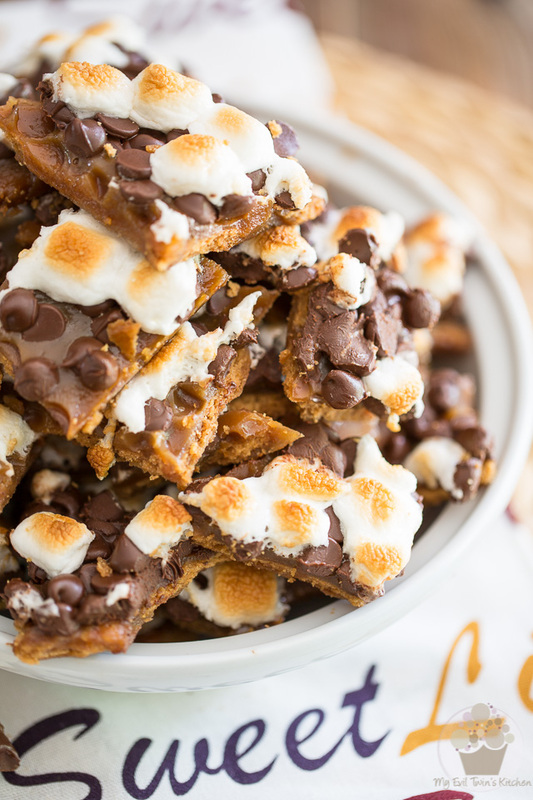 Please, now promise me one thing: if you ever decide to make this S’mores Cracker Toffee recipe, please don’t curse my name as you munch on your 13th piece that day, and don’t hate me for passing down this new addiction of mine. 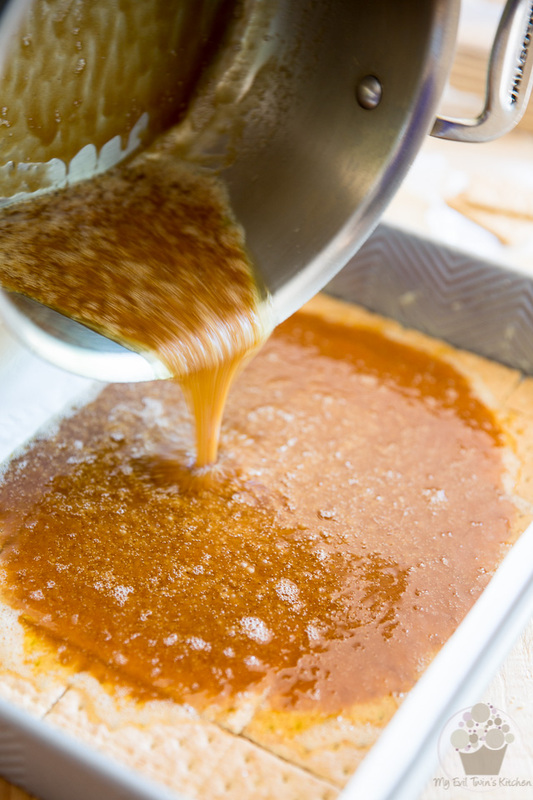 Grease and line a 9″ x 13″ baking pan with parchment paper, leaving a bit of an overhang on either side for easy removal of the toffee once it’s set. 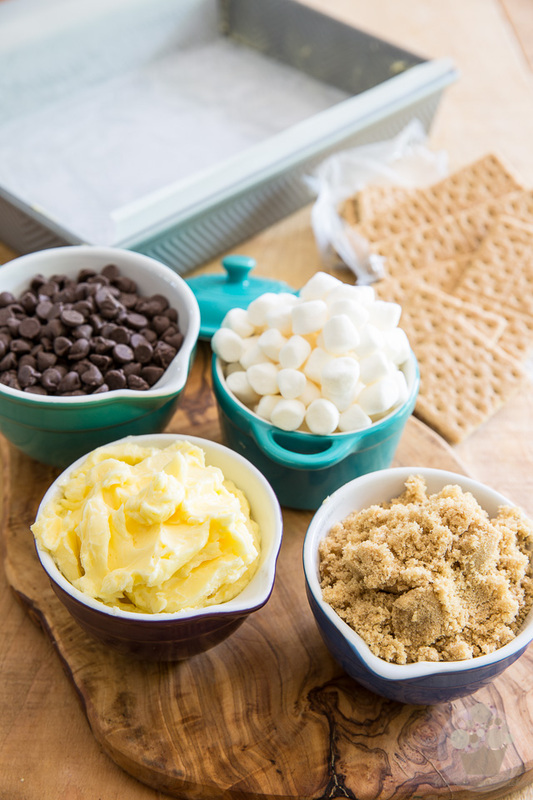 Measure the butter, brown sugar, marshmallows and chocolate chips. Grab one or two packages of graham crackers; you’ll need 10 full sheets total. Theoretically, your crackers should fit absolutely perfectly and cover the entire bottom of the pan. Now that the crackers have been dealt with, let’s make the toffee! 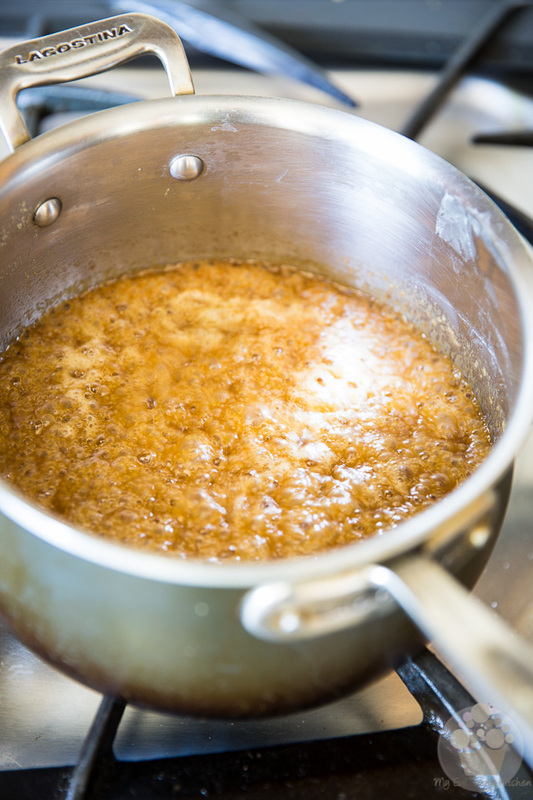 In a medium saucepan, melt the butter over medium heat and then add the brown sugar; stir until the sugar is well mixed in with the butter. Note that the butter and sugar will never fully combine, and that is totally normal. 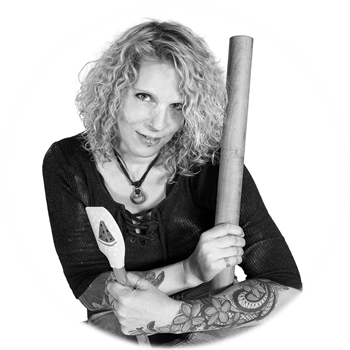 Don’t try and force them to bind by stirring the mixture: if you did that, you’d only run the risk of seeing the sugar turn into one big unusable crystallized lump. Resist the urge and just let that yummy concoction simmer away. Besides, you actually WANT the butter and sugar to remain separated… you’ll soon see why! 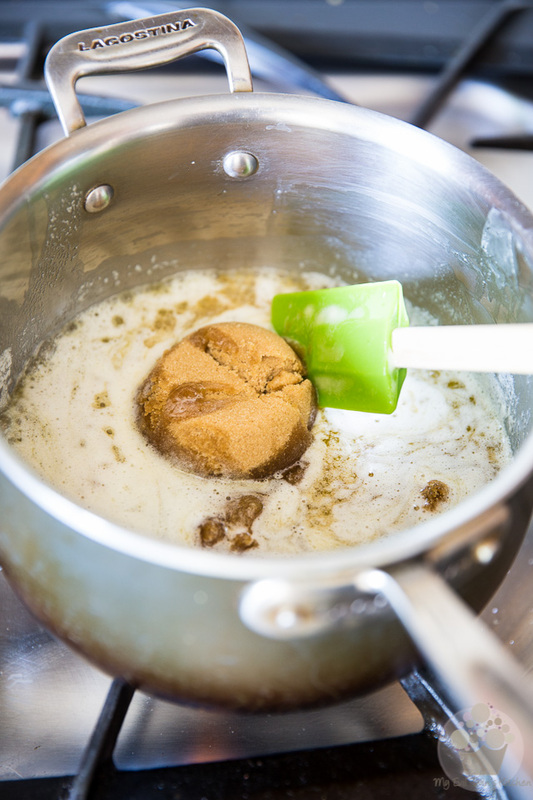 Once the sugar and butter have simmered for 4 full minutes, you want to immediately pour the mixture evenly over the graham crackers, still without stirring! Can you see how the butter is sort of doing its own thing? 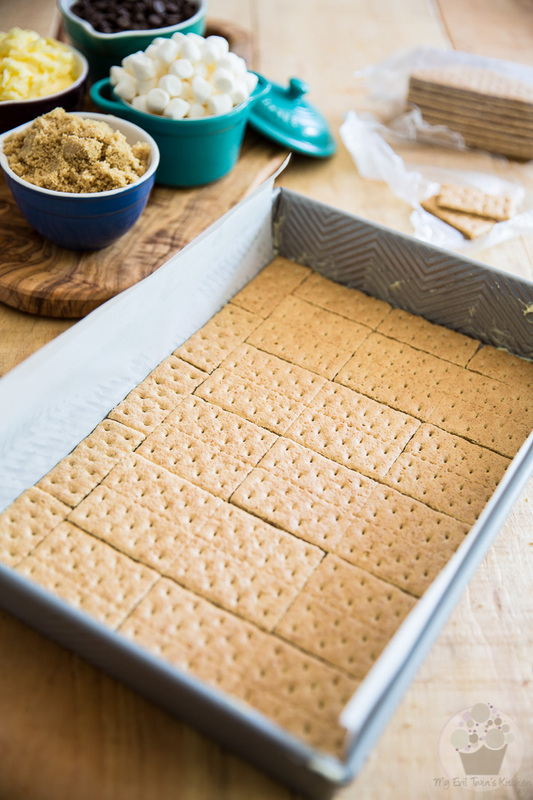 When you pour the mixture over the crackers, the butter, which is now intoxicatingly infused with the flavor of the sugar, will soak right into the crackers, making them all yummy and buttery and delightful, while the sugar will stay on top and turn into a scrumptious layer of crunchy, brittle toffee. 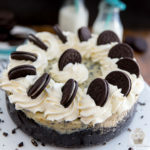 There’s no need to spread this sugary stuff, it’ll do it on it own; just maybe give the pan a little shake to help the sugar settle and then immediately place the pan in the oven. 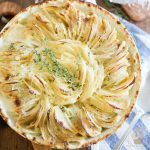 Now remove the pan from the oven and set your oven to broil. 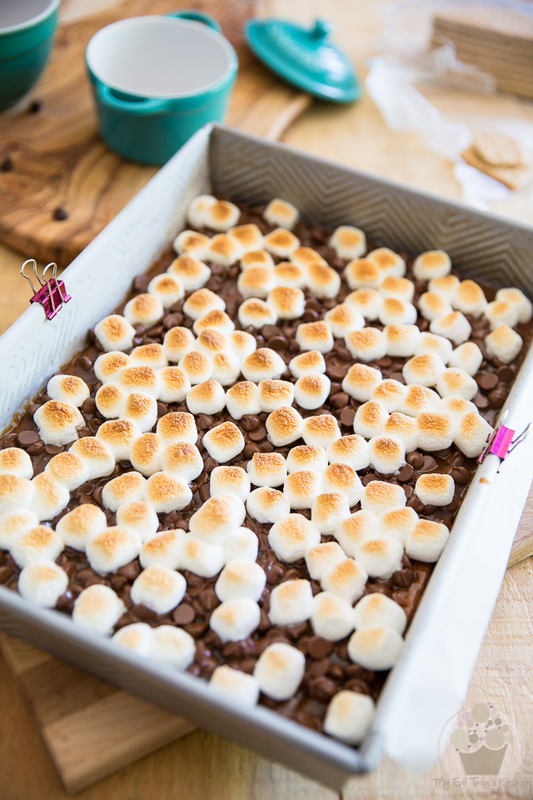 …followed by the mini marshmallows. Return the pan to the oven (now set to broil) and leave it in there, checking it constantly, until the marshmallows start to melt and take a golden brown coloration. This happens really quickly, so I highly suggest that you leave the oven door slightly ajar and peak uninterruptedly! 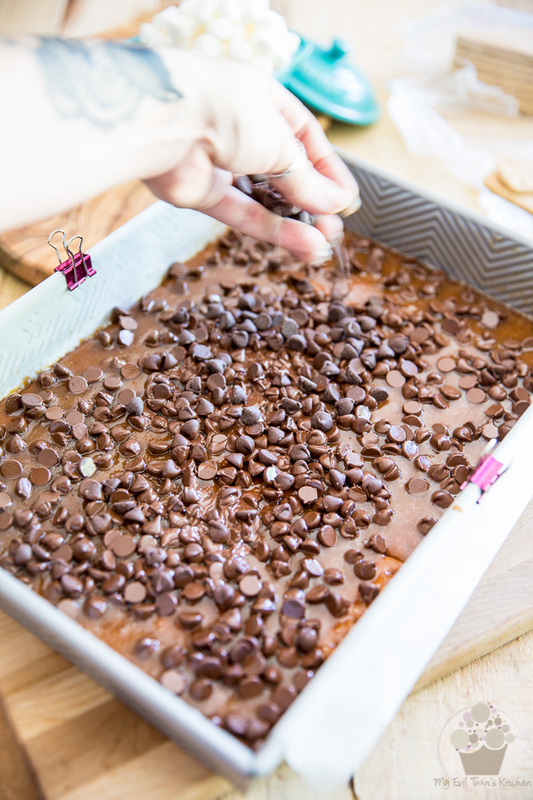 Remove the pan from the oven once again and let the toffee cool to room temperature, then transfer the pan to the fridge and let the toffee chill completely, at least an hour, before breaking it into pieces. If you are in a hurry, you can also send your toffee to the freezer for about 30 minutes. 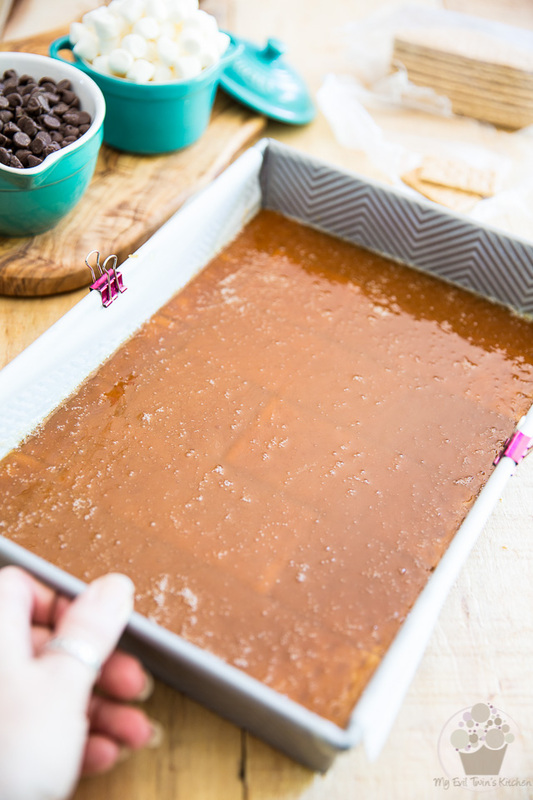 To make the initial break, drop the entire sheet of toffee, from a height of about a foot, onto your table or counter, and then break it into smaller pieces with your fingers. You might not want to make those pieces too small, though… remember what I said about small pieces, right? Store in a cool dry place or in the refrigerator for up to a few weeks. <– A FEW WEEKS!!! HAHAHA! Yeah right… like that’s gonna happen! Grease and line a 9" x 13" baking pan with parchment paper, leaving a bit of an overhang on either side for easy removal of the cracker toffee. Bring the mixture to the boil and let it simmer without stirring for 4 full minutes; the butter and sugar will never fully combine, that is totally normal. 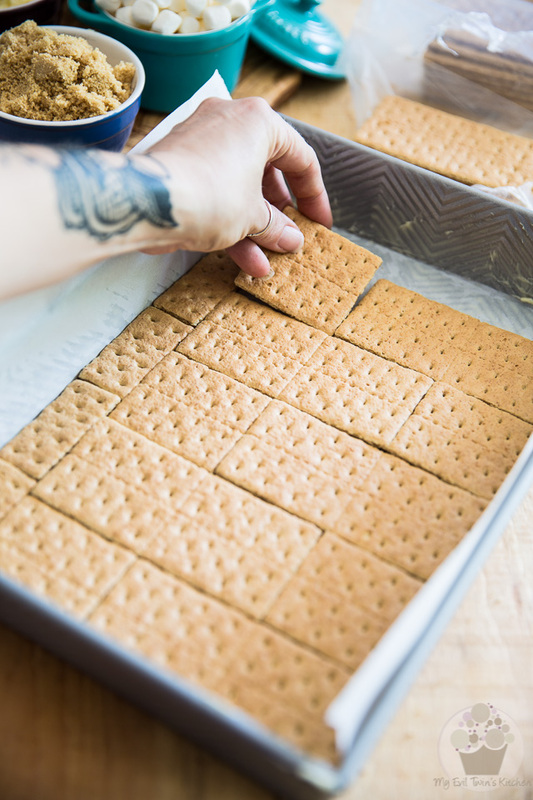 Pour the mixture evenly over the graham crackers and immediately place the pan in the oven; bake for 8 minutes. Remove the pan from the oven and set the oven to broil. 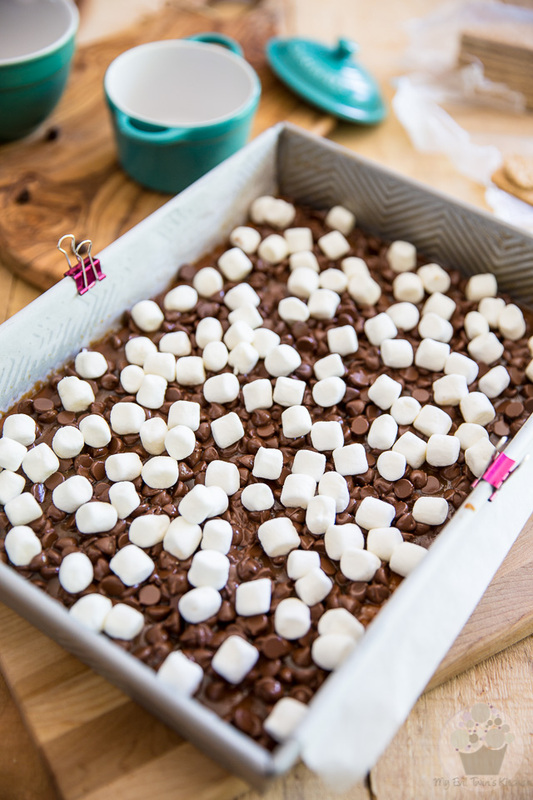 Immediately sprinkle the chocolate chips evenly on top of the hot caramel layer, followed by the mini marshmallows. Return the pan to the oven and leave it in there, checking it constantly, until the marshmallows start to melt and take a golden brown coloration. Store in a cool dry place or in the refrigerator for up to a few weeks. 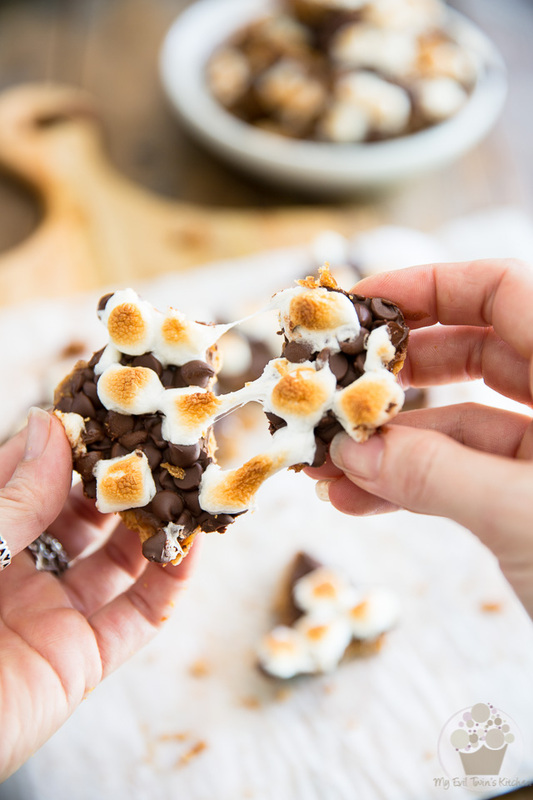 Your smores look awesome. My daughter will absolutely love these so thanks for sharing. 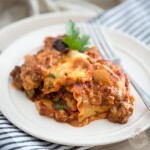 Love the photos and recipes throughout your website. Cannot. Stop. Drooling. 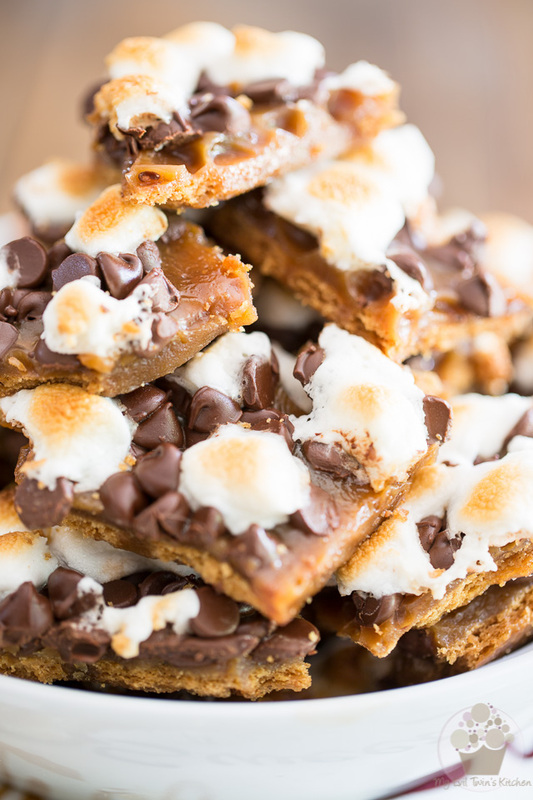 I LOVE this recipe so much, mostly because there’s never enough ways or days to eat s’mores in the summertime! This looks awesome! Oh Sonia… You’ve done it again! This looks like an incredible combo!! 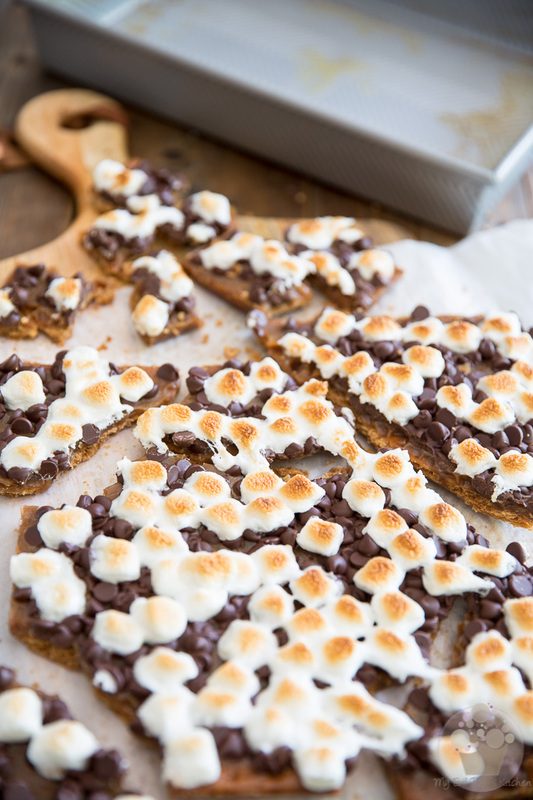 Toffee and s’mores?! Pinning! I can’t even handle this. I’m actually salivating. The fact that you can make something with chocolate that makes me feel this way is quite a testament to your crazy skills. I must have this!!!! Can you please tell me what I can use in place of Graham Crackers here in Australia. Or better still where I can buy them here. How do you think these would be if re-heated before serving for dessert? I love it when s’mores are gooey and warm.